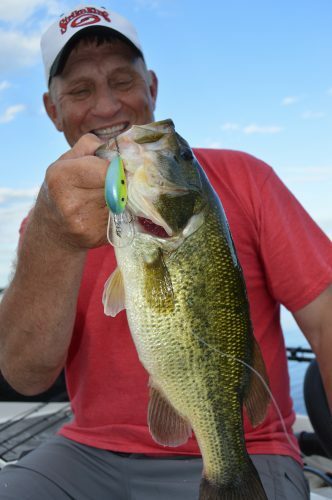 Clear Lake in north central Iowa is a good example of a lake that has cleared up in the past few years, and fishing guide Kevan Paul is catching more walleyes than ever using clear water fishing techniques. If an angler wants to catch more fish, there are a few things that need to be taken into consideration. One really important factor, and one that is becoming more and more prevalent is water clarity. The water in many areas is becoming clearer than it was ten years ago, and that clearer water is having an impact on fish catching. Lakes are clearing up for a couple of reasons. Two primary reasons are runoff and zebra mussels. We’re cleaning up the water that is entering lakes, and the zebra mussels are cleaning up the water that’s already in the lakes. Zebra mussels have entered most bodies of water in only the past few years, but they’re already having a noticeable impact. Following are two things that we can do to catch more clear water fish. I remember a day of fishing on Sturgeon Bay Wisconsin with friends a couple of years ago. Sturgeon Bay is home to extremely clear water. Ice-anglers say that you can see bottom in almost fifty feet of water. That’s clear water, and it requires special fishing considerations if you want to be successful. On this day we were after walleyes. Much of the time we think of walleyes to be bottom-hugging fish, and in many bodies of water they are. But, walleyes are hungry in the summer and fall, so they’ll be wherever the baitfish are. On this day, and on many days on Sturgeon Bay, the baitfish suspend, and the walleyes do the same. At times they’ll be just a few feet below the surface. We employed a trolling presentation that’s very refined and enabled us to keep our spinner rigs where the walleyes were. We used planer boards with Off Shore snap-weights. We set out three lines on each side of the boat. The outside lines had the lightest weights, so those rigs were running closest to the surface. The lines closest to the boat had the heaviest weight. This meant that the lines closest to the boat were running the deepest. We were covering three different depths on each side of the boat. In this exceptionally clear water, most of the walleyes bit on the line farthest away from the boat. We were using Off Shore in-line planer boards with Tattle flags, so the boards were easy to read even when they were a good distance from the boat. Behind the snap-weights were Northland’s Mr. Walleye Crawler Hauler spinners. These rigs have big blades, and in the summer and fall, big walleyes like big blades. We experimented with different blade colors. In these clear waters the more subtle colors were preferred. The rigs were tipped with crawlers. 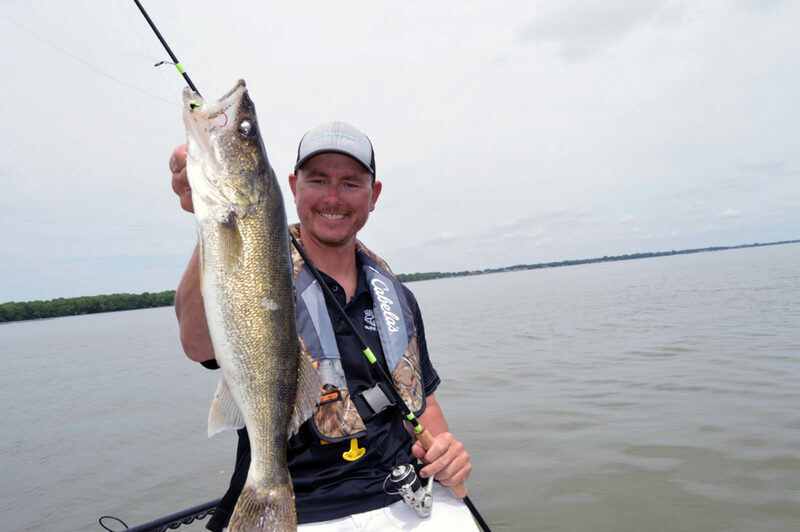 By employing this technique, we caught a good number of walleyes in what some would consider a tough fishing condition. Another idea for catching walleyes in clear water is to fish at night. Light is obviously lower at night, so the fish will move shallower. Some anglers don’t like to fish at night, but in many bodies of water, that’s the best way to catch walleyes from clear water. Try trolling Strike King Lucky Shad crankbaits over shallow rock or sand structures and weedbeds that are near deep water. It appears that clearer water is going to be part of our fishing going forward. Do what you can to avoid spooking the fish, put your bait where the fish are, and you can continue to catch lots of walleyes. Big ones too. Fish are going to eat regardless of water color. Keep the above ideas in mind and you’ll catch more fish when the water is clear.